‘Christmas at the Musicals’ is the perfect way to start the festive season. 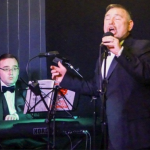 Featuring musical theatre star Mario Frendo, who will be performing a selection of favourite songs from the musicals, with a generous helping of festive songs for this special time of the year. Songs from award winning shows, such as Les Miserables, My Fair Lady, A Chorus Line, Chicago, Bubbling Brown Sugar, and many others, plus some festive surprises, will be on offer. Mario Frendo has performed in many major musicals in London’s West End, and on UK Tour. He has performed throughout Europe, and in New York and Los Angeles. Mario has recorded with the Pet Shop Boys and Eurythmics, and has sung with major recording stars from Whitney Huston to Tom Braxton. The musical director is Richard Bates, who worked in New York with the late Marvin Hamlisch, and has been musical director / arranger for a wide range of musical productions. Richard’s musical ability is now recognised worldwide. He was recently invited to Chicago, USA, to play solo and conduct the Symphony Orchestra in a special gala concert. So, take your seats and enjoy ‘Christmas at the Musicals’. This a great cabaret show, and the Christmas edition will be awesome ! !